Cheesecake has got to be on my list of top 3 favorite desserts, which is why you see it on here quite a bit. You can never have too many cheesecake recipes and the options are seemingly endless (like when you walk into The Cheesecake Factory and take 10 minutes to choose because there are just so many options). One of my favorite ways to make cheesecake (ever since I made these Cheesecake Cupcakes with Salted Caramel Sauce or Strawberry Sauce) is in cupcake form. They are in individual servings, they're easier to serve and clean up, and they make for better portion control (maybe, you might just find yourself eating a few :). This is a cheesecake combo you have to try! 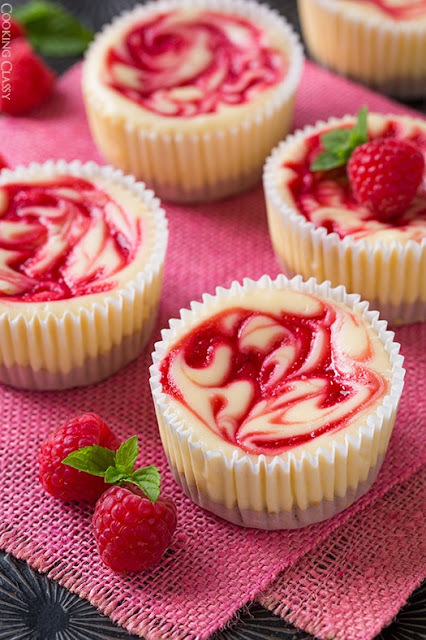 Raspberries and cheesecake were just meant to be together. You get this lightly crisp and crunchy graham cracker base topped with a silky smooth and deliciously creamy cheesecake filling which is then swirled with a fresh raspberry sauce. Heaven in dessert form right here! Try these and you'll understand why I'm completely in love with cheesecake. 0 Response to "Raspberry Swirled Cheesecake Cupcakes"